The race starts in the town of Tralee near the Aquadome. Initially it goes west for about 100m but then it heads north-east towards the 1 mile mark. From there, there is a gentle climb up to about 3.5 miles and then on a downhill slope to Ardfert at mile 6. From Ardfert, the road turns off on to quieter country roads as the course heads south-west. The next 8 miles is probably the most scenic and nicest part of the course. After mile 9, the route turns west for an out and back section. At mile 10, there is the first serious hill which is about 400 metres long. At mile 12, there is another climb but not as serious as before. 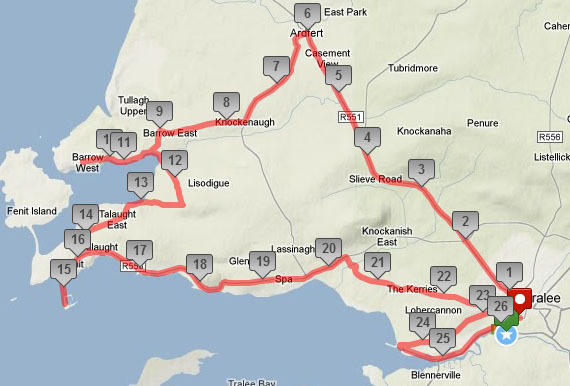 After mile 14, the route heads towards the pier at Fenit before coming back and heading east towards Tralee. The section up to mile 20 has some traffic on it so it's not the best. Just as the course approaches the town near mile 23, it goes off to the south-west. 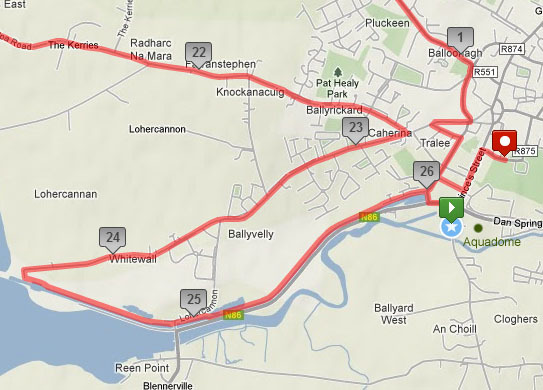 This is a nice quiet section and the route approaches Tralee along a canal walkway. The finish is near the town park. As the elevation map shows above, there are number of hills along the route. Most of them however are short and the one at 10 miles or 16 kms is easily the steepest. Overall.......Nice scenic route to the north-west of Tralee. Very dependent on good weather though as many parts of the course would be very exposed if there was a strong westerly wind. Greats views to the west as far as Mount Brandon on the Dingle Peninsula. Possibly not the fastest of courses but still reasonable.